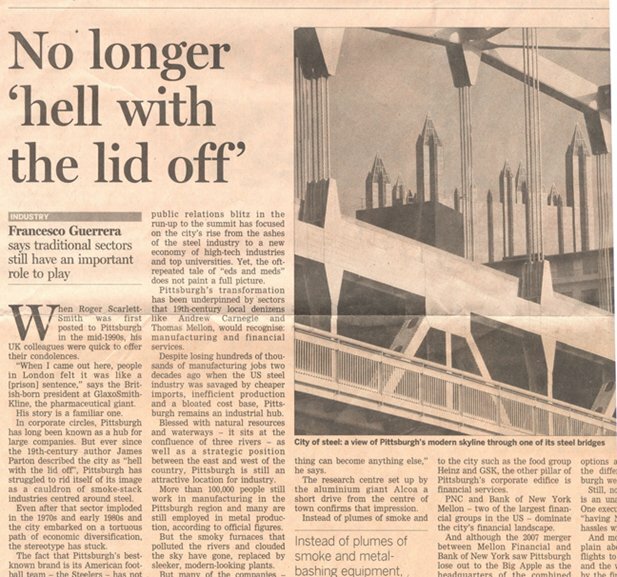 Nullspace: Pittsburgh: No longer 'Hell with the lid off'? Pittsburgh: No longer 'Hell with the lid off'? Curious nobody has really noticed that we are right now exactly 5 years past the G-20 Summit that was hosted here in Pittsburgh, September 24-25, 2009. One could argue it was the singular turning point in the perception of Pittsburgh throughout the world. If you forget the scale of media coverage at the time, literally around the world, it was a bit crazy. What I noted at the time was how everyone loved to re-use, or rather mis-use the Parton quote, but the point is taken. Seriously, if there was a point in time that so quickly reset the image of any region more comprehensively throughout the world, it is hard to find an example bigger than the G-20's impact on Pittsburgh... Still, and maybe much more so now after 5 years, worth asking the question: What did Pittsburgh learn from the G-20? For me looking back, it really is a bit amusing read all the explanations folks give for Pittsburgh's rebirth, if you want to call it that... explanations that followed what was almost universal bashing from the pundits before. Remember Pittsburgh is the place where you want to be at the end of the world, because Pittsburgh only takes up a new idea 25 years after it has been adopted everywhere else... or however that old joke went? Now, everyone is trying to figure out what we were doing over the last 25 years. Go figure. But the neo-punditry would make you think Pittsburgh hit the big 'easy' button and became a new place overnight. But even if it took a long time, what were the reasons? Some say robots, others seriously suggest 'karma,' while others stretch pretty far to say it was our 'healthy living,' an explanation that is really about as cogent as saying it was the Fish that Saved Pittsburgh. Everyone has their own answer, which does not help anyone looking to follow our lead. I agree that the G20 was an important moment, but I don't think it happened in isolation, nor was its timing coincidental. Pittsburgh had already emerged as one of the few encouraging spots in the midst of the Great Recession, and that was a big part of why it was picked to host the G20 on that occasion. Of course the basic story of why it was doing relatively well back then was that the lingering effects of the Steel Bust had insulated Pittsburgh from the housing bubble, which meant it also escaped the subsequent housing bust. The long-past Steel Bust also meant Pittsburgh was no longer significantly exposed to the auto industry collapse that created a double-whammy recession in the otherwise similar "Rust Belt" areas to our west. So not a lot of actionable lessons in that story--you can't create a different economic history in response to a crisis. But good news, Detroit--if there is a housing bubble and bust cycle in 20 years, you probably won't participate in it. Pittsburgh was very pro-active in re-inventing itself. Probably the biggest thing they did was to get funding to clean up and re-purpose all the brownfield sites left behind. The city also took advantage of the vast riverfront areas as people are naturally drawn to water. If there is a lesson for Detroit it is to leave the past behind and look forward. They should bulldoze large tracts of neighborhoods with a high % of abandoned homes and convert them to parks, natural areas, and local farming. Clean up the brownfield sites and install modern utilities and infrastructure to make them magnets for new businesses. And make the most of their water fronts. I wonder if bicycling infrastructure and "green" storm water infrastructure are going to be the next riverfront reclamation projects. Was there much nay-saying at the time about the huge waste of taxpayer money in doing all that heavy remediation for the sake of development setbacks, connecting trails and planting "indigenous fauna"? Sorry, flora. Planting fauna is usually frowned upon. On the original post, I don't think anybody is considering they maybe the change in coverage is a delayed effect of Jeff Goldblume's "Pittsburgh."